Of all Juno has taught us about Jupiter, one fact continues to resonate: Nothing compares to the awe-inspiring beauty of space. If you need a break from all of the cropped, filtered, and hashtagged Instagram photos of last night's Supermoon, then your eyes are in for a treat, courtesy of NASA and its Juno spacecraft. The space agency recently shared an incredible image of Jupiter's north pole, captured by Juno back on October 24. The color-enhanced image shows a section of the massive planet covered in swirling blue clouds that look like they were dreamt up by a 19th-century Post-Impressionist painter. Launched in 2011, the Juno spacecraft began orbiting Jupiter five years later in July of 2016. Since then, it has been taking a lap around the second rock from the Sun at a pace of once every 53 days. That may sound like a lot of time for photo snapping, but JunoCam is only able to transmit 40 megabytes of data back to Earth on each orbit, which makes every image shared a bit more special. Each pixel in the beautiful image is 7.75 miles, and the image was captured when Juno was just 11,747 miles above the clouds at a latitude of 57.57 degrees. "Because of the Juno-Jupiter-Sun angle when the spacecraft captured this image," NASA writes, "the higher-altitude clouds can be seen casting shadows on their surroundings. The behavior is most easily observable in the whitest regions in the image, but also in a few isolated spots in both the bottom and right areas of the image." Newsweek points out that in an image captured eight minutes after this one (but released a week prior) the clouds can be seen swirling in the center of a storm. 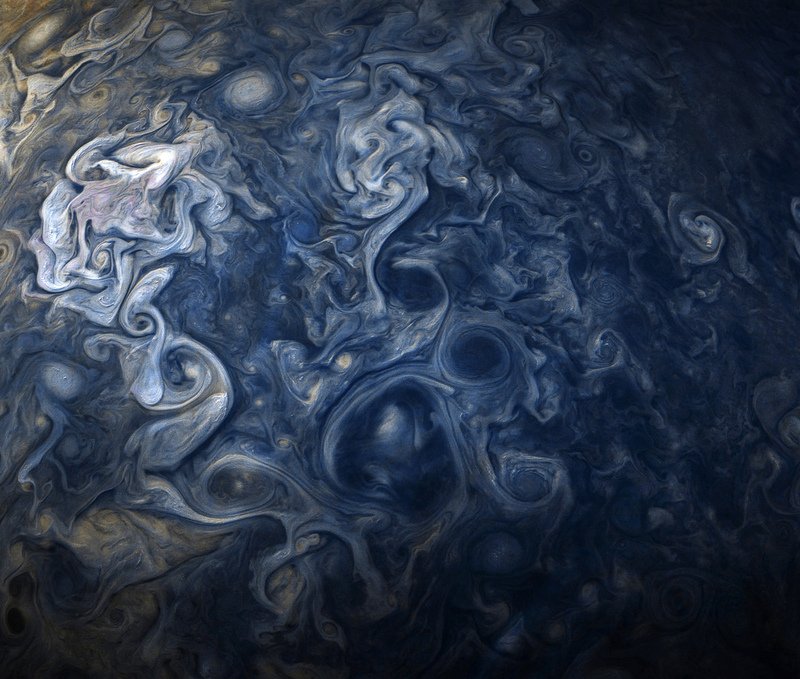 That image has also been color enhanced, and together they paint a picture of Jupiter that is simultaneously tranquil and kind of terrifying.